Selkirk flue components - information about each component, how and where it is used. Selkirk twin wall flue lengths are available in 4 sizes. 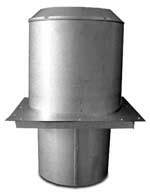 Flue lengths are easy to assemble and can be combined to obtain the required installation height. Standard Selkirk flue straight lengths of 1200mm, 914mm, 610mm, 457mm, 305mm, 152mm (working lengths 1181mm, 876mm, 572mm, 419mm, 267mm, and 114mm) are available as well as an adjustable length (50-200mm). Used in conjunction with Lengths to fit Selkirk Twin-Wall Chimney perfectly. Allows for easy disassembly. The Adjustable Length is not a load bearing component. 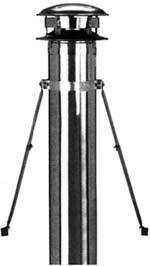 As a vertical expansion compensator, it requires a support every 18m. Components are available which cater for such requirements. Where the system is used with solid fuel, Ventilated Firestops, Ceiling Supports and Joist Shields MUST be used. The adaptor is used to connect the Selkirk flue to the appliance or to single skin flue pipe. 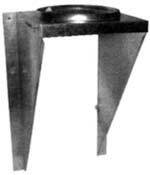 The Anchor Plate can be used for adapting the Selkirk Twin-Wall Chimney System to a "Listed" Factory-Built fireplace. Follow the installation instructions accompanying the fireplace. Stainless steel and heavy gauge steel construction for long life. Retains chimney with a twist-lock connection. A versatile, simple device for increasing stability of the Selkirk STC insulated chimney. Inward flanges around the band fit into grooves at chimney length joints. Reinforces joints of chimney and prevents accidental uncoupling. The Insulated Tee allows the horizontal connection of the Selkirk twin wall flue to the appliance. A Tee Cap allows access for inspection and cleaning. The Insulated Tee Plug allows access for inspection & cleaning. 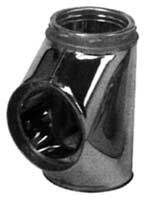 The Drain Tee Cap allows access for draining & cleaning. The use of Locking Bands allow 3600 rotation and lock the Selkirk components together at the exact offset required. 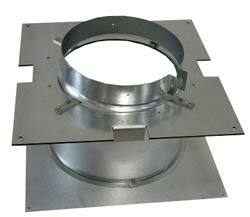 Twin wall flue elbows can be used on the same 51 mm air space clearance as chimney sections. An ideal support assembly for open cathedral ceiling installations. It adapts to all roof pitches and requires only simple framing. The package consists of 2 Chimney Plates. 2 Roof Brackets and hardware. Maximum length of chimney which can be suspended below the roof support is 6.08 metres. Maximum total length (both above and below is 9.12 metres). Chimney Length is not supplied. See also: How to use a Selkirk STC twin wall roof support bracket. Maximum length of chimney which can be supported by the roof support is 6 metres. Chimney Length is not supplied. See also: How to use a Selkirk STC twin wall ceiling support. The New Adjustable Wall Support will allow for an adjustment of 51 mm to 152mm from a vertical wall. For outside chimney installations for use with an insulated tee. Consists of two wall brackets, plate and hardware. The Selkirk Wall Band is used along the wall to provide for 51 mm clearance and assure stability. Required at 2.4 metre or closer intervals above the tee to stabilize the chimney. Stainless steel construction. T450 Rating: SMW-VCS: Ventilated Ceiling Support. Used when venting solid or multi-fuel fired appliances with flue gas temperatures below 4500 C. Used if you will not be ventilating your boxing in - which we do not recommend. 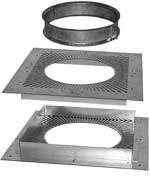 The Firestop Spacer provides additional protection when the chimney passes through combustible materials. It can also be used to finish areas where the chimney passes through non-combustible materials. Must be installed where the chimney passes from one living space to another living space. The Attic Insulation Shield is used wherever the chimney enters an open attic. A Joist Shield is included for use when the chimney is enclosed below the ceiling. Refer to installation instructions for full details. The Attic Insulation Shield acts as an insulation shield to keep blown in or blanket insulation from filling in any framed opening or contacting the chimney. 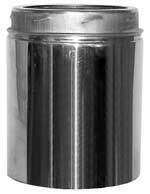 The Sekirk flue rain cap is a domed stainless steel cap that prevent rain entry. The Storm Collar is designed to fit on the round chimney pipe just above the roof flashing. The upper edge of the Storm Collar should be water proofed with non-hardening silicone caulking to prevent any water from leaking between the Storm Collar and chimney pipe. NOTE: Storm Collar is not required with Seldek flashings. Flashings are used to seal the opening where the chimney penetrates the roof and to divert rain and snow down from the roof and away from the chimney system. A Roof Brace Kit can be used whenever there is a need to stabilize the chimney above the rool level. The roof brace kit must be used if the chimney extends 1.5 + metres above the roof.